The Indianapolis Colts held a 23-9 lead over the Houston Texans with a little more than seven minutes left in the game on Sunday night. And if you’re a Colts fan that decided to go to bed after Andrew Luck’s touchdown run and Adam Vinatieri’s field goals that put the team up by 14, you were in for a surprise when you woke up on Monday morning. After a dominant first three quarters for the Colts, head coach Chuck Pagano and company squandered a 14-point lead with two quick drives from quarterback Brock Osweiler and the Houston Texans. Tied at 23-23 with 49 seconds and two timeouts left, the Colts had an opportunity to drive the field and position future hall of famer Adam Vinatieri for a potential game-winning field goal. They didn’t. They went to overtime. The rest is history. The #Texans hit the game-winning field goal in overtime, defeating the @Colts 26-23. Indy will travel to Tennessee next Sunday. For the first time since Vick Ballard in Week 15 of the 2012 season (ironically a loss to the Houston Texans), the Indianapolis Colts snapped a 61-game streak in which they failed to produce a 100-yard rusher. Frank Gore finished the day with 106 yards on the ground, garnering a *small* amount of celebration before the ultimate defeat. Colts kicker Adam Vinatieri also completed a feat of his own, connecting on three field goals to pull into second place all-time for most consecutive field goals made. Vinatieri has now hit 41 in a row, just one shy of former Colts kicker Mike Vanderjagt’s record of 42 straight. The Colts, who now sit alone in the basement of the AFC South at 2-4, will travel to Tennessee to face a Titans team that has won two in a row, and looked somewhat impressive in doing so. 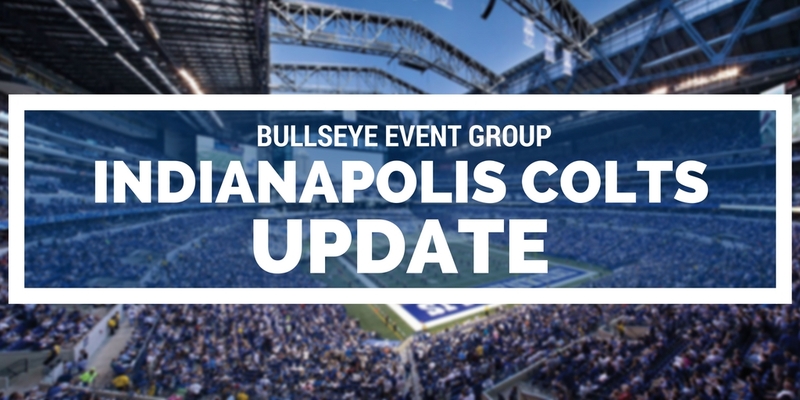 The Colts must win the game in order to not only breathe some life into the fan base, but also to resuscitate their divisional and playoff hopes. The ‘Road to Super Bowl LI’ in Houston is here! As the NFL marches through the season, set your tailgating plans! Tickets for our Colts VIP Tailgate and the 2017 Players Tailgate at Super Bowl LI in Houston available NOW!